People want to engage with leaders, staff and companies they can believe in and have a relationship with. People like you, trust you, and identify with you because of your story. Stories are the fastest way to connect with peers, staff, leaders, and customers, plus build your personal brand. Don’t leave opportunity and progress on the table because your storytelling skills aren’t working, or you haven’t leveraged what it can do for your work/career. Storytelling is one of the most in demand business skills of the century. Its influence and significance is acknowledged by the New York Times, Forbes Magazine, Harvard Business Review, Inc. Magazine, Fast Company, and decades of neuroscience research. Dr. Karen Dietz is one of the movers and shakers in the field of business storytelling, a pioneer in the field, and author of the bestselling book Business Storytelling for Dummies. In today's data-driven distracted world, if you want business results you've got to grab your personal experiences, then add heart + soul. Just story your material to authentically connect with people, keep their attention, and inspire action. Even more, with Karen Dietz, learn to positively impact at least five areas of your organization with just one powerful method. Who exactly needs business storytelling skills? Anyone who wants to advance their work, their career, forge alliances, and make a difference in the world. Karen’s clients range from rising stars all the way up to the Fortune 500, including nonprofits. Companies like Walt Disney Imagineering, Chase Manhattan Bank, Avery Dennison, Thrivent Financial, Veterans Administration, Cincinnati Chamber of Commerce, Citrix, California Bank and Trust, Just In Time for Foster Youth, and Princess Cruises. Assessments, coaching, consulting, speaking, online training, webinars, and workshops. Karen draws on her know-how to provide practical experience, guidance, and Just Story It kits that get the job done. As a Folklorist and trained ethnographer, Karen has helped a variety of consumer brands with their storytelling. With marketing specialists for LG electronics, she spearheaded a story gathering project to help the company connect to user values, identify needs, and highlight buyer's experiences with the brand. Similar work was done for Princess Cruises. Karen helped Disney in a knowledge management project gain know the qualities of an enduring icon, how they begin to disintegrate, and what to do to preserve the brand. Karen is talented in collecting your customer stories and digging into them to help you find just the insights you need. Use her knowledge and experience to move boring product descriptions into engaging stories that connect with customers. Karen has helped neighborhood redevelopment groups, collaborations of government and service providers, nonprofits servicing specialized groups, philanthropic organizations, and firms with a social cause tell their stories for greater visibility, winning grants, and raising a lot more funds. She's helped nonprofits build storytelling into daily work to create self-sustainable storytelling that becomes part of their DNA. They never run out of stories to tell. Karen has also created the world’s largest free online library of quality material on business storytelling at www.scoop.it/t/just-story-it. Join her 17,500+ followers for the resource that is used by businesses, story professionals, and educators worldwide. “What can I say--you inspired me to tell our company story, and then I was able to excite everyone by just telling our story! It is unbelievable how by changing my approach and story, I was able to have the people in the company think differently. As a result, we quickly raised $1 million in seed money.” Thank you so much, Karen. Karen Dietz is a veteran in business storytelling and is one of the pioneers in the field. She works with leaders who want to harness the power of storytelling to make a difference, inspire others to action, create engagement plus alignment, leave a lasting legacy, and never ever be boring. 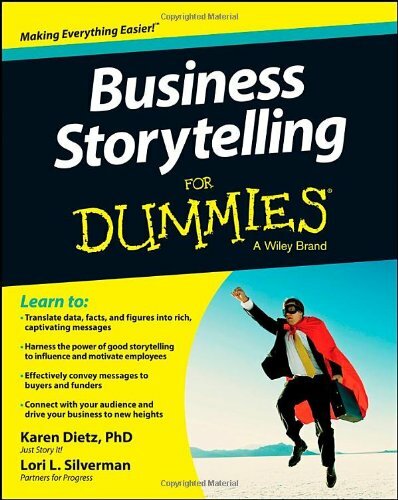 As a speaker and storyteller for business, John Wiley publishers recruited Karen for their Dummies series. In 2013 her deeply rich how-to book Business Storytelling for Dummies, full of hard-core examples, was published, quickly praised, and became a bestseller within a year. Steve Denning, when writing the book, The Leader’s Guide to Storytelling: Mastering the Art and Discipline of Business Narrative (2005), asked Karen to contribute to the chapter on storytelling and values based on her years of work in the field. For 3 years Karen conceived and collaborated on a book with Lori Silverman, writing vital sections to Wake Me Up When the Data Is Over: How Organizations Use Stories To Drive Results (2006) where 70+ amazing companies participated. Since 2005, Karen is featured in a total of 8 books on business storytelling. She received her Master’s and PhD from the Department of Folklore at the University of Pennsylvania, where the department and was the most advanced place to study in the field when Karen attended. During that time Karen learned the power of storytelling plus the care and feeding of stories from a traditional Chippewa Cree sacred storyteller. As Karen moved from academics into the business world, she continued being trained in the art of storytelling by internationally top ranked performance tellers. Her BA is in communication from Marietta College in OH. Karen is also the former Executive Director of the National Storytelling Network, a national association of 2,400 performance storytellers. Her mission during those 3.5 years was to grow, develop, and expand the influence of storytelling. For 6 years she was also the Program Director, then Chair, of the Story in Organizations community of practice, which helped establish business storytelling as a field of work both here and abroad. Put banner ad images and links to your books, articles and free resources and offers here. Speaker, San Diego TEDx -- on the impact of story listening to change lives and companies.